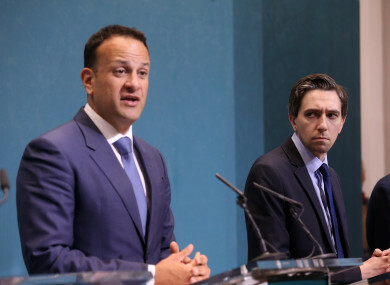 TAOISEACH LEO VARADKAR and Health Minister Simon Harris were both adamant today that the CervicalCheck memos sent to the former HSE boss were never brought to their attention. Yesterday, it was revealed the memos outlined the results of the audit and how it would be communicated to the women. It outlined that CervicalCheck had a “communications protocol” in place to deal with negative media reports and said it should expect such headlines like ‘screening did not diagnose my cancer’. Former HSE boss Tony O’Brien, who resigned from his post yesterday, confirmed at committee that he had received the memos. Harris has since called the documents disgusting. While the focus yesterday was on what was contained in the memos, today questions are being asked about how these important memos were not highlighted to the health minister or Taoiseach (Varadkar was health minister from 11 July 2014 – 6 May 2016) The memos relate to March and July 2016. According to Varadkar there is a protocol in place to ensure such important issues are raised with the Taoiseach or minister of the day. In any given government department there over half a million documents go through it at any given point, said the Taoiseach, who added that it is simply not possible for ministers to see all documents. Varadkar and Harris saying they did not see the memo. Harris says he ‘very annoyed’. There is a mechanism in which documents or matters of importance are raised with ministers and the Taoiseach. Varadkar said the system failed in this incidence. “It is done through submissions, it is done through memos, significant issue papers or ministerial or management board meetings. The department has confirmed that neither I or minister Harris had sight of these issues,” he said. That is in line with my recollection and the department has confirmed that. Would I have liked to know? Absolutely I would have liked to know. He said he is often briefed on health issues and how they are being handled. He said the questions he always asks is open disclosure is being adhered to, who is looking out for the patients? The Taoiseach said politicians are always concerned if they are being left in the dark on important issues. He asked his advisors when the memos first came to light if anyone knew anything about it, said Varadkar. They have reassured him they did not. Harris said did the same, and his advisors were also not aware. Members of the opposition are tonight seeking answers and calling on the government to find out who knew what when and why the minister and Taoiseach were not informed. They argue if it is discovered that HSE or department officials were aware of the memos, and failed to notify government ministers, there should be accountability and they should go. “Individual accountability is necessary,” said the Taoiseach, pointed out there have been a number of resignations already. Varadkar said the best way for accountability is through the commission of inquiry – not through the media, the Dáil or an Oireachtas committee. The Taoiseach said everyone is entitled to due process and fair hearing. Varadkar was also asked today why Tony O’Brien has now left his position, while the Department of Health’s Chief Medical Officer Dr Tony Holohan, who also saw the memo, has not. Varadkar and Harris both expressed their confidence in Dr Tony Holohan. The Taoiseach said O’Brien resigned from his role. That does not mean that Dr Holohan is immune from accountability, but he is entitled to due process, he added. Harris said he thinks politicians “can be held to account for what they knew, and what they did with what they knew”. I think there are responsibilities and accountabilities that aren’t just for politicians. There are other people who worked in the public service, in the civil service, in jobs that are well remunerated that also have accountability. I’m happy to defend my actions based on what I did, what I knew and when I knew. We simply can’t account for what we didn’t know. But we can and we will demand the answers as to why that was the case. He agreed with the Taoiseach and said accountability will be done in a manner that is fair and in a manner that is dedicated to getting all the facts and all the information. Harris said the Scally inquiry, due to report in June, will look at the interactions between the Department of Health, the HSE and other agencies. “I want answers, I want answers as much as you. But I want them through a process that can give us real and meaningful answers that we can then act on,” said the minister. Email “'We can and we will demand answers': Varadkar and Harris want to know why memos were kept from them”. Feedback on “'We can and we will demand answers': Varadkar and Harris want to know why memos were kept from them”.